With approximately 18 months left in the “Pursue the Future” campaign, the finish line is within sight. At the time of printing, more than $32 million of the $40 million goal had been secured. This year will be significant for the campaign as five of the University’s major regional campaign events are scheduled and a number of smaller receptions and cottage group events are being planned. “Strong regional efforts are important to the success of our campaign. 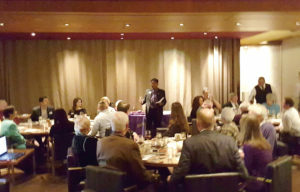 We are tremendously grateful to have strong regional campaign teams who are energizing our base of supporters through their enthusiastic and consistent outreach,” said Charles Hunsaker, co-interim director of advancement. The total impact from regional campaign efforts during the public phase of the campaign, which began in July 2015, has now exceeded $9.8 million. The campaign is scheduled to conclude June 30, 2018. To learn more about the “Pursue the Future” campaign, go to campaign.truman.edu. This entry was posted on January 18, 2017 by kbest. J.R. and Alberta Harris (front row, left) sent nine of their children to the University. The 1970s were a time of change for the United States. Three presidents occupied the Oval Office during that 10-year span, which is remembered for Watergate, gas lines and the last of the moon landings. Anti-war rallies, common during the decade’s early years, were replaced by the rise of social and environmental movements. Hank Aaron supplanted Babe Ruth as the all-time home run leader, and Atari introduced Americans to a new way to pass the time. Elvis died, The Beatles stopped making music and disco was all the rage as the 1980s approached. Although change was sweeping the nation – even in Kirksville where the school officially became NMSU in 1972 after trading the word “college” for “university” in the name – there was one constant on campus. No matter the year, it was always possible to find at least one of the Harris siblings working toward a degree. Six of them attended the school during the ’70s. J.R. Harris owned and operated a gas station in Macon, Mo. His wife Alberta was a homemaker and assistant elementary school teacher. When the time came for college, they sent nine of their 10 children on the short trip north to Kirksville. 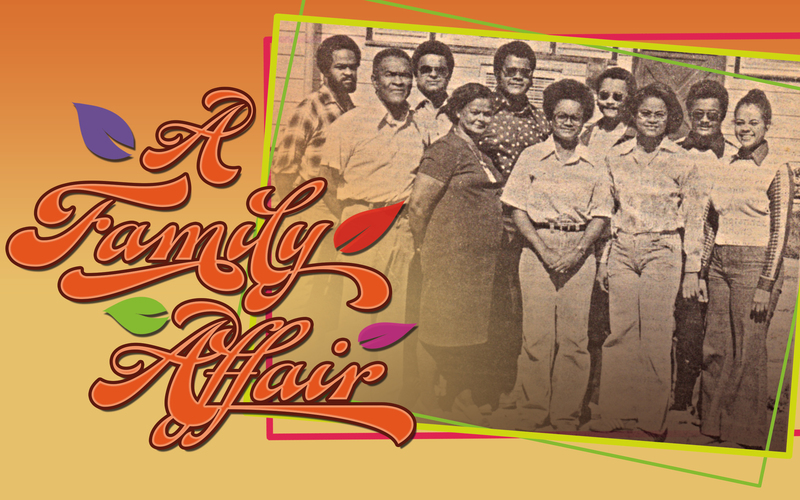 “My parents were looking for an affordable place that was close to family,” Tony Harris (’77) said. For the better part of two decades there was usually a member of the family enrolled at Truman, starting with Michael in the early 1960s all the way through Dawna in 1982. Attending the University became a family tradition. The University does not officially keep track of family lineage statistics, so it is impossible to know where the Harris family ranks historically as far as the number of siblings to attend, but one thing is for sure. In terms of making Truman a family tradition, the Harris family is not alone. In addition to being Truman siblings, twins Alex (left) and Nick Ponche are also the children of alumni. Their parents Tom and Diane received degrees from the University, as did their sister Kalen. 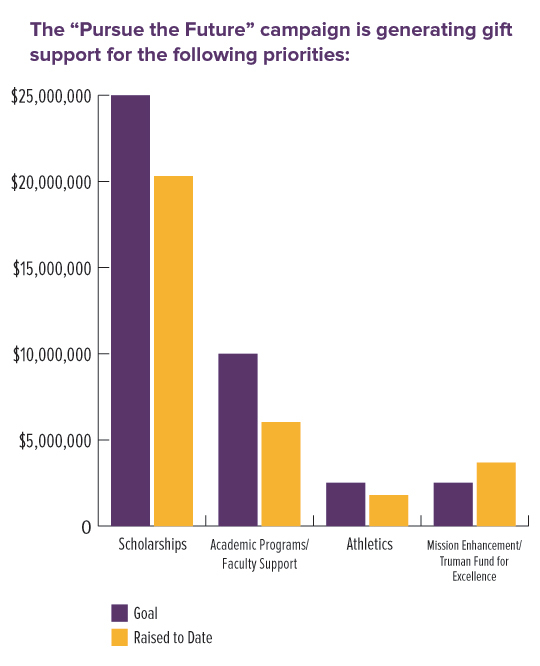 During the 2015-16 school year there were approximately 175 sets of siblings attending Truman, comprising more than 350 students with some sort of family tie. 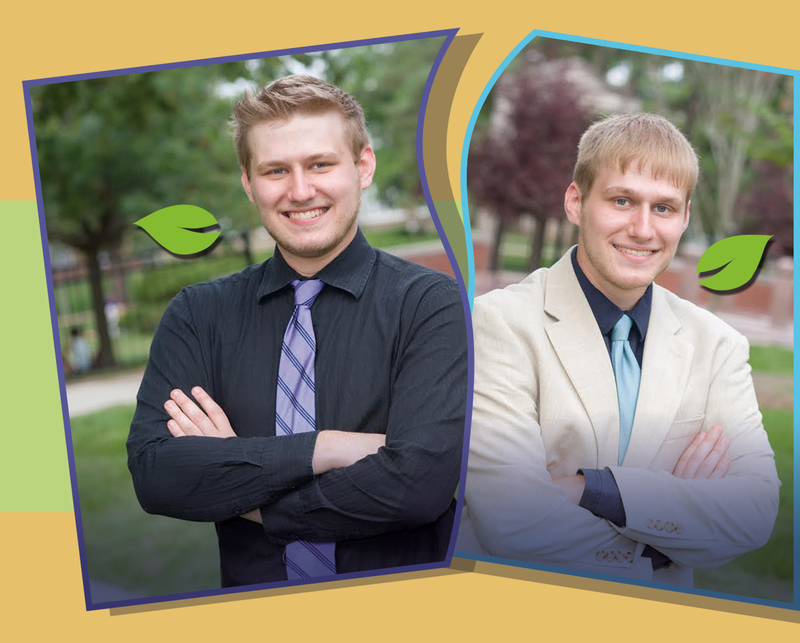 Twin brothers Alex and Nick Ponche separately made the decision to attend Truman. Being at the same school has been convenient for a number of reasons, not the least of which is always having someone to share the drive with to their home in St. Charles, Mo. The brotherly bond is not the only family connection for the Ponches. Both of their parents, Tom (’80) and Diane (’79, ’80), are alumni of the University. Sister Kalen Ciszewski (’07) also earned a degree at Truman. Despite those ties, the twins never felt pressured to attend. Affordability was a factor, but so were the results they witnessed firsthand. Nick and Alex are in good company in regards to continuing a family legacy. Of students attending during the last year, 339 had at least one parent who received a degree from the University, while more than 100 were the offspring of an alumni couple. Convenience might have been a big reason the Harris family started attending Truman, but the quality training they received played a part in why so many of them kept coming back. Six of the Harris siblings pursued education-related degrees. Tony, Debra and Dawna were the only ones to enter the field professionally, but regardless of the degree earned, all of the siblings moved on to successful careers. “Though I didn’t follow my educational field, the fact that I am a college grad opened employment doors for me,” Herman said. The vice president of his senior class, Herman (’72) worked as a supervisor for the Peabody Coal Company for 19 years. He followed that with a 22-year career with the Missouri Department of Transportation. Excluding his time at the University, Herman has always called Macon home. This afforded him the opportunity to care for his parents in their later years. He is the last member of the original family of 12 to reside in Macon. A desire to stay close to family was a motivating factor for many of the Harris siblings to attend Truman, but as the years passed, life pulled them in different directions. A majority of them still live in the Midwest, but none of them share the same hometown. Michael and Jerri are the outliers, living in California and Georgia, respectively. Michael is a retired customs broker and Jerri works for Siemens in demand creation for trade shows and events. She also was an Olympic Village director during the 1996 Atlanta games. Despite the physical distance, the family still remains close. Some Truman family trees stretch far and wide. It is common to see generation after generation attend the University. At the same time, new family trees are started on campus every year. During their time as students, many individuals meet the person they will one day marry. According to the Office of Advancement, Truman has more than 10,000 alumni couples. Together, they account for nearly 20 percent of University alumni. Rarely a year goes by without an on-campus proposal or a wedding in the Sunken Garden. David and Becky Crawford met in a sign language class. They have been married for 16 years and have three children, Gabe, Nathan and Ellie. During his sophomore year, David Crawford (’00) requested to take a sign language class typically reserved for senior students. Crawford spent his summers working at a camp for critically ill and disabled children, and learning sign language would allow him to assist those with hearing impairments. In class, he regularly sat by Becky Winfrey (’98) and the two developed a friendship. “We soon became study partners, but I think it was just an excuse for us to spend some time together,” Crawford said. Winfrey was among a small group of friends that Crawford recruited to work at the summer camp with him, and it was there that they became more than study partners. They have been married for 16 years and have three children. The Harris family tree grew a few new branches because of Truman. Kevin and Debra both met their spouses on campus. Although he earned a degree in business administration, Kevin (’81) was also active with the University band. He counts the relationships he made through the Music Department as some of the most important in his life, even today, but one in particular stands out among the rest. Mutual involvement in the marching band brought Kevin and Lisa Ellington (’83) together and they were married in 1985. After Kevin’s career took them to St. Louis, Kansas City and Detroit, they now reside in Lenexa, Kan. Kevin has spent the last 20 years in media marketing and Lisa is a clinical trials researcher. Lisa’s marriage to Kevin is not the only branch on her Truman family tree. Her cousin Desirae Ellington (’80) also earned a degree from the University. Debra and husband Irvin West (’76, ’77) both graduated from Truman as well. After being a stay-at-home mother during her children’s formative years, Debra later put her Bachelor of Science in Education and Master of Arts in speech pathology degrees to use in the Jefferson City public school system. She still works for the district two days a week as a speech pathologist in a kindergarten special needs transition classroom. Irvin earned two bachelor’s degrees and a master’s degree and is now retired after a career with the state of Missouri. Although it occurred under the name West, Debra and Irvin’s offspring carried on the family tradition of attending Truman. 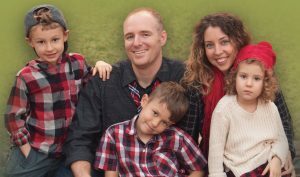 Both of their children, Adrienne (’03) and Daniel (’10), received degrees. Adrienne also met her husband, another Truman graduate, while attending. When all is said and done, including spouses and children, the Harris family tree touches 15 individuals who account for 18 degrees cumulatively. Many students and alumni never have direct family ties through Truman, but usually they can still find that inclusive atmosphere. Parents feel safe about dropping their students off on move-in day because of the level of camaraderie they experience on campus. Many alumni can attest to making some of their closest, lifelong friends within the first few days of classes. That sentiment resonated with almost all of the Harris siblings as well. “I remember making many friends, and how helpful the staff were if you had any problems,” Kerry Harris said. Kerry, who retired from Associated Elected in 2013, credits the University with showing him how to form bonds with his co-workers. Debra and her husband still enjoy close relationships with a handful of people they met at Truman. Tony remembers his four years in Missouri Hall, and being one of a select few students who were invited to the home of President Charles McClain for a monthly lunch meeting with students. Jerri enjoyed her time at Truman to the extent she found excuses to stay around as much as possible. As a resident advisor, some of Jerri’s fondest memories included all-night movie-fests with other Ryle Hall students. play, concert, movie or just having a pizza at Pagliai’s,” Herman said. The connection can come in many forms. It might be a daughter moving in to the same residence hall her mother and grandmother occupied before her. Often it is twins taking the journey to Kirksville together. Occasionally it comes in the form of old friends who have known each other so long they simply refer to one another as brother, long after their fraternity days have passed. No matter what it looks like, they are all part of the Truman family. 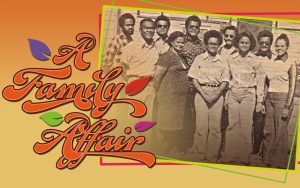 Although their career paths led them in different directions, the Harris family has remained close. Front row: (from left) Debra, Jerri and Dawna. Back row: Kerry, Kevin, Herman and Tony. Not pictured: Michael and Hubert. This entry was posted on June 15, 2016 by kbest. The Warner family had children attending Truman for 14 consecutive years. 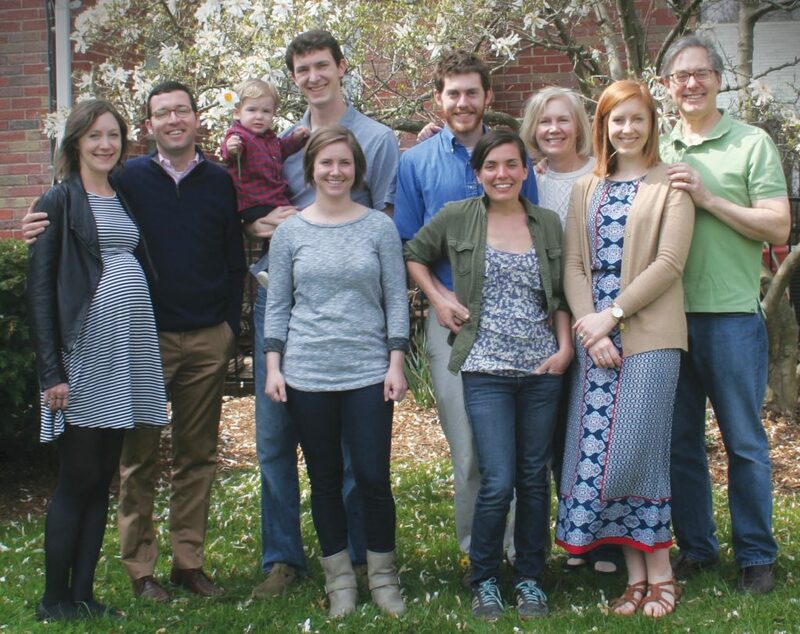 Pictured, from left: Sarah and husband Ryan; John, holding son William, with wife Kendra; Dan with wife Jackie; and parents Mary and Ted with youngest daughter Colleen. Thousands of romantic comedies all have one thing in common. No matter the odds, the couples always end up together. For three members of the Warner family, their stories share one more dynamic. They all met and married a significant other from Truman. Ted and Mary Warner had no ties to Truman, but they encouraged their oldest daughter Sarah to consider the school during her college search. Little did they know they were starting their family on a path that would last more than a dozen years and net them several new additions. “We had heard good things about it, both from friends whose kids had gone to Truman and from her school guidance counselor,” Ted said. Sarah came to Truman in 2002, forever changing the course of her family history. Within 10 years, siblings John, Dan and Colleen would follow, and the three older Warners would eventually find their spouses on campus. Although the stories of their relationships all share a Truman connection, how they got to their happy endings are each unique. For Sarah Warner Tichenor (’06) and husband Ryan Tichenor (’06), their story hinges on some happy accidents. They met during the interview process for the Student Activities Board, and if not for a bag of marshmallows and some flakey friends, their lives may have been entirely different. With no time to spare, Ryan raced to the Student Union Building and grabbed a newspaper to use as his item. It worked, and they both made the cut. They became friends through SAB, but their relationship did not begin in earnest until after their time at Truman. Sarah went to graduate school at St. Louis University, and when Ryan was moving back for a summer internship, he contacted Sarah and invited her to get together with some mutual friends. “They backed out of our planned happy hour, so Ryan and I had our first date,” Sarah said. Not long after that, the two began dating. They have been married since 2010 and welcomed their first child, Elle, in April. John Warner (’09, ’10) may have followed in his sister’s footsteps by coming to Truman, but his relationship journey with wife Kendra (Kirk) Warner (’09) was entirely different. The two lived across from one another in Centennial Hall. By December of their freshman year, John and Kendra were officially dating and have been together ever since, even while Kendra attended graduate school at Missouri State University in Springfield. The two were married in 2012 and welcomed their first child, William, in 2014. In comparison to John and Kendra’s traditional love story, the case of Dan Warner (’12) and Jackie Kinealy (’12) seems to be one of free spirits that happened to find each other. Jackie earned her history degree in four years, but decided to stay at Truman another two years and pick up a degree in communication as well. It was during that fifth year that she met Dan when he hired her to work at the Index. A year later they began dating after working together on a story for the paper. Following graduation, Jackie lived in Denver, Colo., for about a year before moving to Twin Falls, Idaho, where Dan was working as a newspaper reporter. The proximity to the Snake River Canyon and Sawtooth Mountains provided ample opportunities for camping and hiking. A cross-country move to Northampton, Mass., located between Boston and the Berkshire Mountains, gave the couple new grounds to explore. In October 2015, they got married and moved back to St. Louis to be close to family. Dan runs his own video production company, Fat Chance Media, and Jackie is a certified yoga teacher. Colleen Warner (’15, ’16), the fourth and final sibling, kept up the family tradition of attending Truman. She was in the third grade when Sarah set the family plan in motion. It is yet to be seen if Colleen will end up carrying on the other Warner family tradition of marrying a significant other from Truman. For now, her graduation marks the end of an era. At least one Warner child was enrolled at the University for 14 consecutive years. Several years will pass before William and Elle will be next wave of Warners to start looking at colleges. Considering the number of family members who attended Truman, they may receive a few unsolicited suggestions as to where they should go. This entry was posted on June 14, 2016 by kbest. The Bulldog wrestling team celebrated its 50th anniversary this past season and it was a freshman that led the charge. 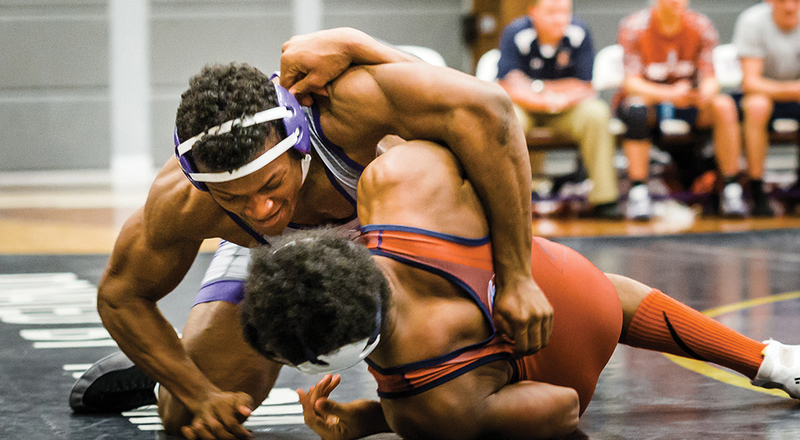 Sam Reeves led the team in wins (23-12 record) while competing at the 197-pound weight class. Reeves had the deepest run of any Bulldog wrestler at the NCAA regional tournament, which took place in Sioux Falls, S.D. He won two of his first three matches, with his only loss coming to top-seeded Ryan Beltz of Maryville (Mo.) University by a 3-1 score that had Beltz scoring the final two-point takedown as time was expiring in the match. As a team, Truman went 8-11 in dual matches and was a perfect 4-0 in Pershing Arena. After Reeves, Ethan Rentschler was second in wins with 18, and three Bulldogs, JJ Dorrell, Steven Serbinski and Roark Whittington, all finished with 16 victories. Freshman Cassidy Smestad accomplished something that no other Bulldog had done in more than 30 years. 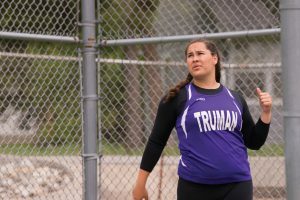 Smestad was the Bulldogs only individual conference champion this year as she won the shot put at the GLVC Outdoor Track and Field Championships in May. She was the first shot putter since Marlene Frahm to win the conference shot put in 1985. She earned a provisional mark during the indoor season in the shot and was 16th in the spring on the NCAA Division II outdoor performance list. She finished the season with a 15th place finish at the NCAA Division II Outdoor Track and Field Championships. The Bulldog women finished fourth as a team at the conference outdoor meet with junior Karina Critten earning All-GLVC honors with a second-place showing in the hammer throw. 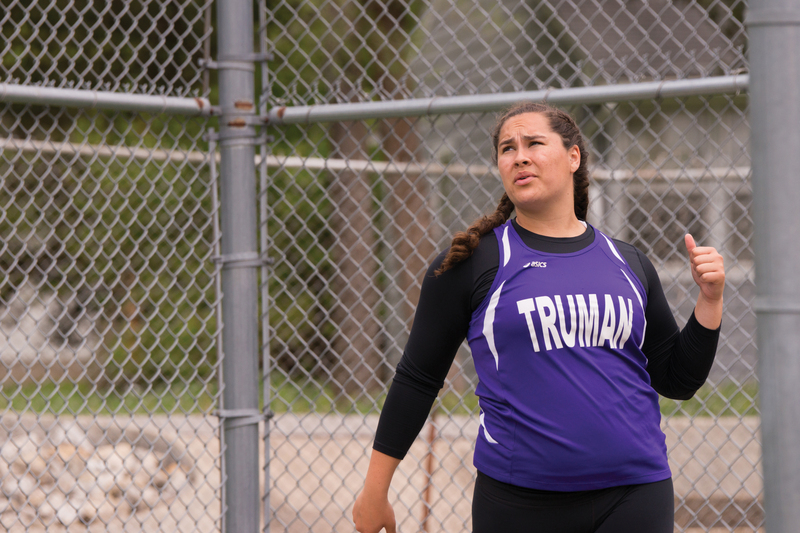 Critten earned a spot on the medal stand with a third-place finish in the discus, as did senior Marie Arnett in the hammer and junior Laura Tarantino in the 10,000-meter run. Freshman Tahj Gayfield had his hand (or legs) in four third-place finishes for the Truman men at the GLVC outdoor meet. Gayfield was third in both the 110 and 400 hurdles, then was among three freshmen on both third-place 4×100 and 4×400 relay squads. Senior Dominic Kacich ran provisional times in the 400 during both the indoor and outdoor season with freshman Elijah Farrales nipping at his heels. Kacich was fifth to Farrales’ fourth at the indoor meet, but in the outdoor meet Kacich was fifth and Farrales was sixth. Junior Brice Pavey was the lone all-conference indoor Bulldog with a second-place finish in the mile. The first Great Lakes Valley Conference title for the women, and a combined nine qualifiers between the men’s and women’s teams, highlighted the 2015-16 edition of Truman swimming. After a strong regular season that saw the squad pick up dual victories against Division I programs Illinois State and Western Illinois, the Bulldog women rode a strong final day at the 2016 GLVC championships to surge past long-time rival Drury and capture the league championship. 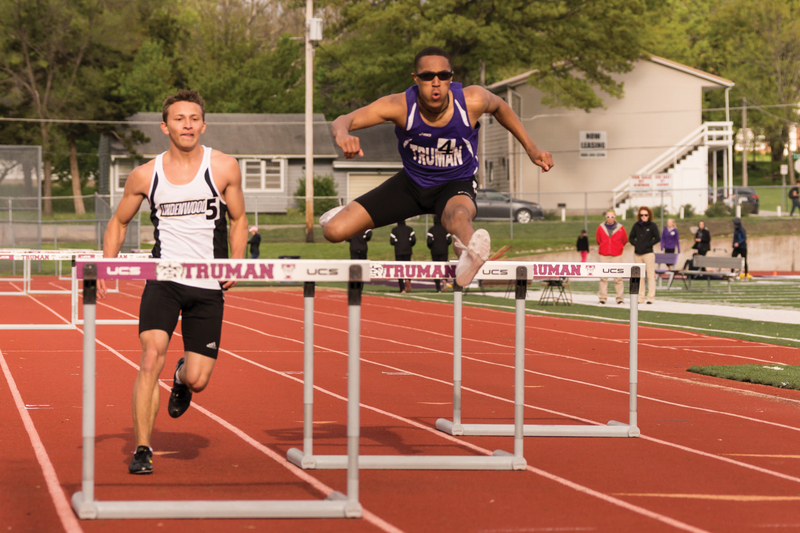 Truman trailed DU by 52 points before racing past the Panthers to win by nearly 40 points overall. In addition to the women’s team title, both programs earned individual laurels as Will Shanel and Evyn Spencer were each named the GLVC’s Swimmer of the Year on their respective sides while Emma Barnett captured the league’s women’s Freshman of the Year Award. Head coach Ed Pretre was voted as the conference’s women’s swimming Coach of the Year. At the national championships, the Bulldog women scored 119 team points and finished 12th overall, while Shanel scored 25 total points on the men’s side as Truman’s lone representative. Truman will return to the pool in mid-September for season-opening events in the Pershing Natatorium. Sophomore Nicolle Barmettler became the first Bulldog to qualify for the NCAA Division II tournament in eight seasons as she was the top individual for the Bulldogs all season long. 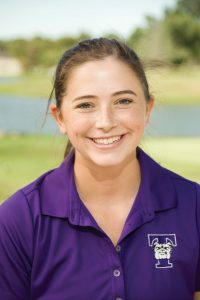 Barmettler placed 18th out of the top golfers in the East region and found herself in the top 20 for the 10th time in as many tournaments this season. She had a scoring average of 78.75 and has landed in the top 20 in 18 of her 19 career tournaments through two seasons as a Bulldog. She won the season-opening William Jewell Fall Tune-up with a pair of 75s, tied for second at William Penn and third in the rain-shortened Missouri-St. Louis Invitational. As a team, Truman placed 10th at the GLVC Championships in late April with Barmettler leading the way with rounds of 77, 79 and 81. The Bulldogs softball team returned to NCAA regional play for the third-straight season and 17th overall time in school history. Truman finished the regular season with a 30-18 record and garnered the No. 6 overall seed in the Midwest Regional. However, the offense that had propelled the Bulldogs all season went cold against some of the toughest pitchers in the region at the tournament, and they lost two games by scores of 3-0 and 2-0 to see their season come to an end. Freshman Christa Reisinger was named the GLVC Freshman of the Year and was part of six All-GLVC selections for coach Erin Brown’s team. Reisinger hit .402 in 49 games with six doubles, four triples and nine home runs. Reisinger stole 42 bases out of 48 attempts to lead the GLVC by 15 steals. Senior pitcher Kindra Henze was the other first-team all-conference selection and posted a 1.93 ERA with a 12-9 overall record. Fellow pitcher and senior Kelsea Dorsey earned second-team All-GLVC honors for the fourth straight year. The third team was dominated by infielders in senior third baseman Cate Simon, junior catcher Lex Van Nostrand and sophomore first baseman Ashley Murphy. Simon led the team in home runs with 11 and Van Nostrand was first in RBIs with 35. For the fifth time in program history, the Truman women’s basketball team reached the 20-win plateau as Amy Eagan’s Bulldogs finished 20-10 while advancing to the quarterfinal round of the Great Lakes Valley Conference postseason tournament. The Bulldogs did it with a strong defensive effort as they held opponents on average to 55 points per game and set a school record with 130 blocked shots in a season. Of the 130 blocked shots, 59 came from senior Michalina Tomczak. She earned third-team all-conference honors and led the league in blocks. 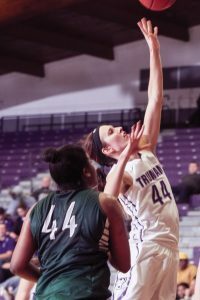 Her season total was the second-most by a Bulldog player, and she finished her career as one of only three Truman players to block more than 100 career shots. Joining Tomczak on the all-conference team was senior guard Courtney Strait on the second team. Strait led the team in scoring at 10.5 points per game and will leave Truman with the most games played in a Bulldog uniform (115) and highest free throw shooting percentage ever at more than 86 percent. As a team, Truman set a new school record in conference wins with 13 as they finished third in the GLVC West Division. They defeated Missouri-St. Louis 59-51 in the home tournament game Feb. 28 to set up their quarterfinal game against Quincy (Ill.) at the Family Arena in St. Charles. It was the ninth meeting between the Lady Hawks and Bulldogs over the course of three seasons, and this time Quincy got the upper hand with a 62-49 win over Truman. 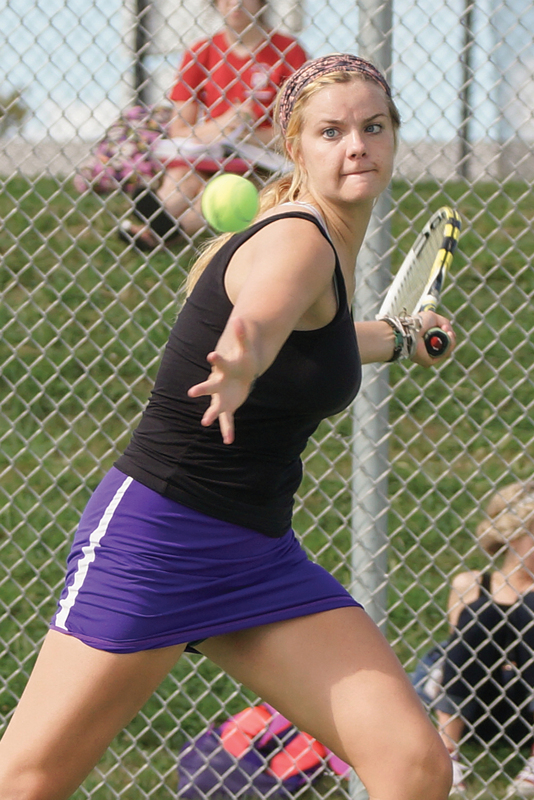 It was a tough year on the courts for the Bulldog tennis teams. The Truman women were 1-10 overall and the men were 1-11 in duals while both squads went 0-5 in the GLVC. Freshman Gavin Hatter led the men in singles victories with five, and had half of the team’s doubles match wins with four. Sophomore Paul Province was second in wins, having registered four. Sophomore Lindsey Schlichting had the top win total on the women’s side with four. The squads were relatively young as only three seniors dotted the roster between the two programs.